Over geologic history, the seas have risen and fallen, following the decline or increase in the volume of the world’s glaciers and ice caps. Currently, glaciers are melting, ocean temperatures are increasing and seas are rising at an accelerated rate. People living by the sea have attempted to block rising waters and prevent subsequent coastal erosion by armoring the shoreline. One method of armoring the shoreline is building a seawall. This activity, that cuts the connectivity of the land to the sea, causes loss of sandy beaches and other sediments in front of the wall and may not protect homes and businesses from flooding during large storms. Estuarine and coastal habitats are among the world’s most heavily utilized and most threatened natural systems. Oyster reefs, a rare and imperiled habitat, are no longer found in Long Island Sound. Connecticut citizens have never seen vast oyster reefs along the coastline because by the early 1900s they were already eradicated; the shells were ground for manufacturing cement and building roads. Overharvesting of oysters led to the demise of the living part of the reefs and the rest was cleared away for use in construction and to ease navigation of the coastal waters by boats. Oyster farming took over the supply of living oysters, and it wasn’t until the back-to-back occurrence of Hurricane Irene (2011) and Superstorm Sandy (2012) that homeowners began to realize the structural importance of these estuarine habitats. Here we describe our plans to restore a system of coastal habitats with the idea of restoring all the benefits interconnected estuarine habitats provided 150 years ago. Stratford Point is located on the Lordship peninsula at the mouth of the Housatonic River Estuary in Stratford, Connecticut. Stratford Point is surrounded on the south and west sides by Long Island Sound. To the north is the Town of Stratford, home to over 51,000 people. The site, a former gun club, has been extensively remediated to remove lead shot and consequently the salt marsh also had to be removed. The intertidal zone sediments were excavated, scrubbed and replaced, leaving several acres clean but biotically depauperate. Over an eight-year period, more than 100 feet of upland coastline was lost along the northeast coastline. The marsh was replanted in 2001, but storms and herbivorous geese caused the restoration to fail. To afford some protection to newly planted trees and shrubs in the upland and to abate shoreline erosion, a sand dune was constructed on top of long, interlocking sand socks (called geo-tubes) filled with a mix of sand and organic matter, covered with a sand/soil mix, then planted with dune grass. The 10-foot high dune stretched for over 900 feet along the northwest cove. While a winter storm in 2012 and Hurricane Sandy washed away much of the sand and soil, the geo-tubes held. The effort to restore habitats at this site in isolation of each other has been unsuccessful. Researchers from the Biology Department of Sacred Heart University (SHU) collaborating with the Connecticut Audubon Society and DuPont have determined that a whole ecosystem approach was needed to increase the chances of a successful restoration. The upland, dune, salt marsh and intertidal zone would be installed together, creating a living shoreline. With support from the National Fish and Wildlife Foundation, DuPont and CTDEEP, this spring we will install over 100 feet of shellfish reef structure using dome-like concrete structures called reef balls. This will allow the dissipation of wave energy, reducing erosion, increasing fine-grained sediment deposition for salt marsh colonization and speeding the establishment of the marine estuary community. The living shoreline will make an ideal habitat for a number of species of bivalves and nursery habitat for fish. This project will be monitored for at least ten years, and much of the fieldwork will be accomplished by research assistants enrolled in SHU’s Environmental Science & Management program. 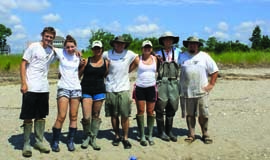 The purpose is to not only set up a restoration project that will examine how to speed the recovery of the interconnected habitats of an estuary through the installment of reef structure, salt marsh grass, and soft-structured reinforced dunes for shoreline stabilization and resiliency, but to also educate the next generation of environmental scientists.